Two species of crocodile are found in Queensland: saltwater crocodiles (Crocodylus porosus) and freshwater crocodiles (Crocodylus johnsoni). Saltwater crocodiles are found in coastal regions from Rockhampton north and are dangerous to humans. Occasionally they have been sighted as far south as the Mary River on the Fraser Coast. In 2013 construction work in the Brisbane northside suburb of Geebung uncovered ancient crocodile fossils in a layer of shale oil 15 metres underground. 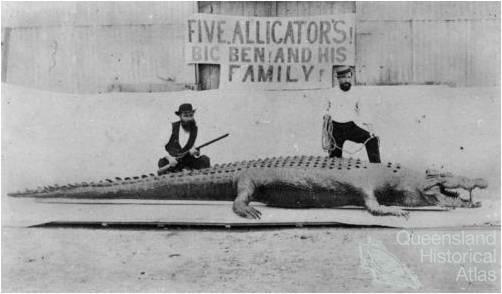 Crocodiles were the original targets of commercial hunting. Freshwater crocodiles are smaller and live in fresh and slightly salty water in tropical Australia. After 1959, as saltwater crocodile numbers declined and skin processing technology improved, freshwater crocodiles were also hunted commercially. Crocodiles have long been hunted by Aboriginal people for their meat, but the danger associated with the hunt meant that human beings did not have an impact on crocodile population numbers before the late 1940s. In the late-nineteenth and early-twentieth centuries European settlers in the north killed crocodiles, but no systematic hunting occurred. Hunting was opportunistic and individual crocodiles were killed by locals fearful for their safety, by visitors in search of novelty, and by rural workers when an opportunity offered itself. 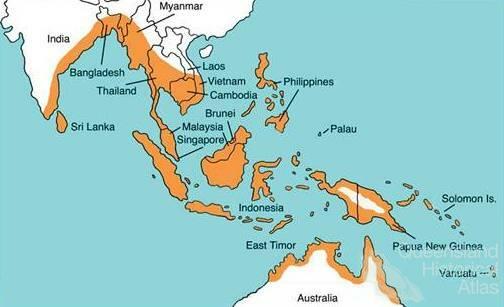 The crocodile population as a whole was not affected. 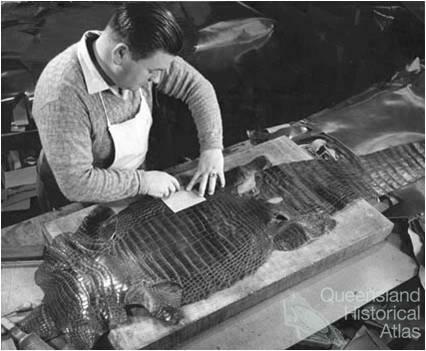 Australian commercial crocodile hunting dates from the 1930s but at this stage it generally involved the employment of Aboriginal people to supply crocodile skins using traditional hunting methods. 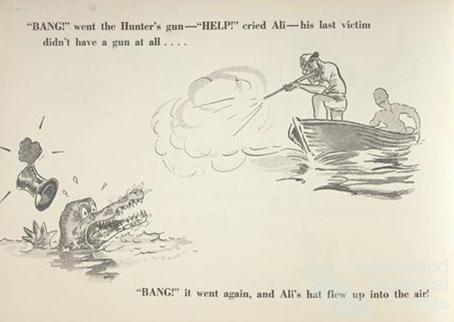 The ready availability of .303 rifles in the wake of World War II provided a sufficient caliber to reliably kill a saltwater crocodile, something that lighter rifles could not. In addition political unrest in Africa cut off the usual supplies of crocodile skins, increasing international prices. These two factors meant that North Queensland’s crocodiles could be killed fairly readily and profitably. 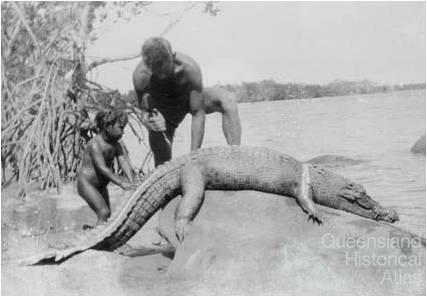 A range of different types of crocodile hunting developed during the 1940s, 1950s and 1960s in Queensland. 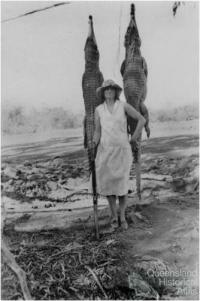 Commercial hunters killed crocodiles and efficiently retrieved their skins which were sold to dealers in Cairns. In the wake of the war there were many men (and some women) familiar with firearms, eager for adventure, and unwilling to settle down into suburban life. 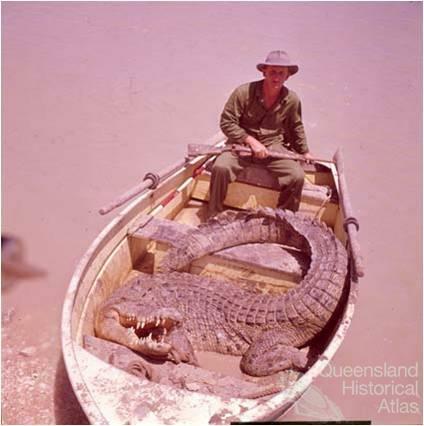 Crocodile hunting was a dangerous business, but this group of hunters were effective and caused a significant decline in crocodile numbers across northern Australia. Cairns became a centre for skin dealers who acted as middlemen between the hunters and overseas buyers. The lure of adventure brought less commercially-focussed hunters north as well. Melbourne hairdresser Rene Henri founded the Australian Crocodile Shooters’ Club in 1950. The Club aimed to help tourists, particularly from New South Wales and Victoria, experience crocodile hunting in North Queensland. At first the Club promoted safari cruises along Cape York in the Tropic Seas (a boat captained by Vince Vlasoff) but in 1952 the Club expanded its operations by establishing a permanent base at Karumba in the Gulf of Carpentaria which it named the Gulf Country Club. Australian Crocodile Shooters’ Club members travelled to North Queensland to experience a luxurious hunting experience rather than to kill crocodiles in commercial quantities. A third group of hunters also came north. This group styled themselves professional hunters, but were really on a type of working holiday. They sought adventure without the cost of a complete safari experience, attempted to pay their way by killing and skinning crocodiles, and generally did no better than break even financially. They killed many crocodiles, but did not always manage to secure commercially valuable skins. 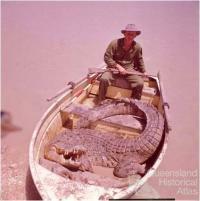 The profitability of crocodile hunting, as well as its adventurous aspects, led to a steep decline in crocodile numbers across northern Australia by 1960. Saltwater crocodiles became increasingly difficult to find – in part because their numbers declined due to hunting pressure, in part because they became more wary of humans. In addition road access throughout northern Australia was improving and new areas of crocodile habitat were accessible to hunters. At the same time hunters developed spotlighting techniques, allowing them to hunt at night. Freshwater crocodile skin is intrinsically less valuable than that of saltwater crocodiles because of its texture. In addition it had originally been useless in the skin trade because of bony plates in the belly region. The 1959 commercialisation of a mechanical process to strip these plates from freshwater crocodile hide, coupled with the decline in saltwater crocodile numbers, meant that freshwater crocodiles also became targets for crocodile hunters during the 1960s and their populations also decreased dramatically. 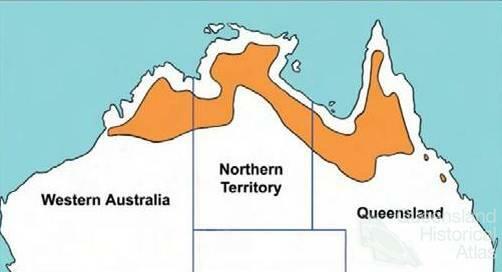 Despite scientific recognition of the devastating impact of hunting on crocodile populations as early as 1960, the Joh Bjelke-Petersen National Party Government (1968-87) was reluctant to limit crocodile hunting. Queensland was the last jurisdiction in Australia to legally protect crocodiles and legislation was not introduced until 1974 when full protection was given to both species of crocodile. Western Australia had banned hunting of freshwater crocodiles in 1962 and saltwater crocodiles in 1970. In the Northern Territory hunting bans had been enacted in 1964 and 1971. Some crocodile poaching continued immediately after the end of legal crocodile hunting, but a Commonwealth ban on the export of crocodile skins effectively ended commercial crocodile hunting in Queensland. In 1985 Australian crocodiles were moved to appendix II of the Convention on International Trade in Endangered Species of Wild Fauna and Flora (CITES) to allow the development of crocodile ranching. Ranching involves gathering, hatching and raising crocodile eggs laid in the wild. The continuing international demand for crocodile leather and the success of ranching then led to the development of crocodile farming. Australian crocodile farms rely on breeding stock captured from the wild. Only crocodiles that are a danger to humans – because of their location and behavior – may be captured. They are then relocated to crocodile farms. Such animals cannot be killed and farms are not allowed to profit from their bodies in any way. However, the eggs of captured crocodiles can be collected and hatched by crocodile farmers and captive-born crocodiles are killed when they reach wallet, bag, or boot size. Crocodile farms in Queensland are found throughout the natural range of saltwater crocodiles. They include farms in Cairns, Palm Cove, Rockhampton, Innisfail and Mareeba. They do not raise freshwater crocodiles as the skins are less valuable. The farms also act as tourist attractions and produce crocodile meat as a byproduct. Since protection was introduced wild crocodile numbers have started to recover. Human populations in North Queensland have also increased. In the colonial period crocodiles were regularly sighted near urban areas in the north, encouraged by the rubbish produced by butchers, boiling down works, and abattoirs. In Townsville in the 1870s crocodiles were known to walk the main street at night when the tide was in. Such a situation is unacceptable in the present and the reclamation by crocodiles of habitat in areas used by humans has resulted in discussion about the best way to manage them. At present problem crocodiles are captured and relocated, although some illegal killing of crocodiles occurs and there is interest in creating a strictly controlled crocodile safari hunting industry in North Queensland.